Saint Bonaventure was a Bishop, and a Doctor of the Church. He was born in Tuscany, in 1221. He received his name when his mother was pleading in prayer to St. Francis of Assisi, for John’s recovery from a dangerous illness. Foreseeing the future greatness of little John in a vision, she cried out, “O Buona Ventura”, meaning, “O good Forune”. From that day on, John was called Bonaventure. St. Bonaventure did suffer from a life threatening illness effecting the bowels as a young child, and that prayer to St. Francis of Assisi saved his life. At age twenty two, St. Bonaventure entered the Franciscan Order. Having made his vows, he was sent ot Paris to complete his studies. While in Paris, he became a close friend of St. Thomas Aquinas. He received his Doctor of Theology, together with his friend, Thomas Aquinas. At the age of thirty five, he was chosen General of his Order and restored a perfect calm, where peace had been disturbed by internal dissensions. He did much for his Order and was the composer of the “Life of St. Francis”. 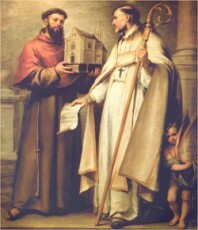 He also assisted at the translation of the relics of St. Anthony of Padua. He was asked to be Archbishop fo York, by Pope Clement IV. In his humility he begged not to be forced to accept that position. Gregory X assigned him to even a greater position, the Cardinal and Bishop of Albano, one of the six Sees of Rome. In Bonaventures many studies, deep understanding of the faith, and his ability to Shepherd with compassion and Wisdom, he was ranked as one of the greatest Doctors of the Chruch by the Franciscan Pope Sixtus V. He died of natural causes while he was assisting at the Second Council of Lyons, on July 15th, 1274. He is the Patron Saint of bowel disorders – as it is believed that was the cause of his childhood illness that nearly took his life. St. Bonaventure’s life teaches us many things. First of all we can count on Church Triumphant – the Saints, to intercede for us when needed. If his mother hadn’t called out to St. Francis to save her son’s life, he would most likely have passed as an infant. He in return, dedicated his life to serving others through the Church. His virtues of humility and compassion were his guiding force as he shepherded his flock. His gift of Wisdom won for him the title “Doctor” of the Church. We can always reach out to the body of Saints to intercede for us, and the life of St. Bonaventure shows us that. It is only by focusing outside of ourselves and serving others that we too, can be of great value to those around us. St. Bonaventure shows us this, and is remember over 8 centuries later.